Prepare to be inspired and why not share your treasure too? When the same place gets mentioned by seemingly every guidebook, list or person who’s been to a given city, you know you have to go. I’m covering a lot of cities on my trip across the US, but no eatery has been as consistently recommended as Cafe Du Monde in New Orleans. On my first full day, a Saturday, the queue is down the street. Now I’ve queued for coffee before (Monmouth Coffee, Borough Market, step forward – it’s well worth it) but this is something else. The outdoor covered terrace area is huge – this is no tiny third wave coffee haunt. Instead, I opt to try the jambalaya at a restaurant opposite and come back another day. I will plan. I will be prepared. I will come early. On Monday morning I come back, it’s barely 10am. On the walk from my accommodation in the Arts District shops are still closed, New Orleans – as you’d expect from a party town – is still waking up. But there’s a long queue at Cafe Du Monde. After a few minutes, I ask ahead and find out it’s a queue for take-out, so it’s a free-for-all to grab a table, if you can find one. There’s a few lurkers doing the rounds, grabbing tables before they’ve even been cleared, still laden with dirty cups, crumpled serviettes and the remains of beignets that couldn’t be conquered. There’s icing sugar under each and every table. I settle for one inside and pick the corner by the window for best people watching – an activity you do a lot of, traveling alone. A chirpy waitress takes my order of small black coffee and beignets, but I switch tables and a waitress who’s clearly been here a while (and I don’t mean just her shift) brings my order. She barely even looks at the guys on the next table and gazes out the window vacantly when she takes their order. My beignets (a type of French dougnut) and coffee arrive, laden with so much icing sugar it forms peaks and resembles a mini-mountain range. I have to tap off the excess not just in a vain attempt to save my thighs but to reduce the risk of choking by inhaling at the wrong moment. 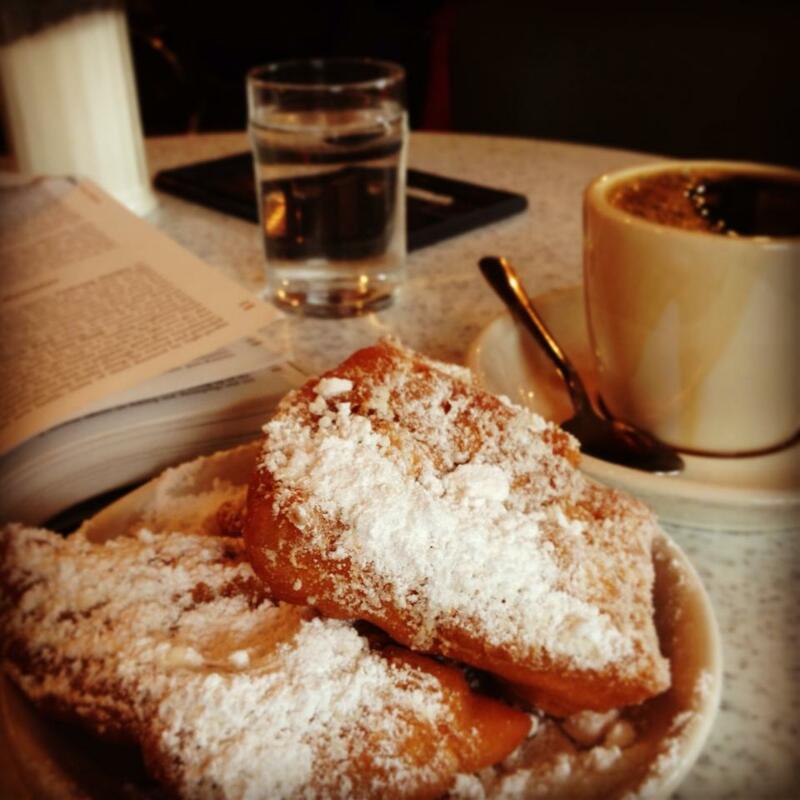 Just warm, soft, sweet with the tiniest hint of a crisp outer, these beignet are delicious. The coffee is not bad at all either (and this comes from a wannabe coffee snob who has a habit of asking US baristas for a custom order). From my window seat I can see New Orleans life pass by, observe the hustle and bustle inside… and all for just $5.30. A great way to pass an hour in NOLA.